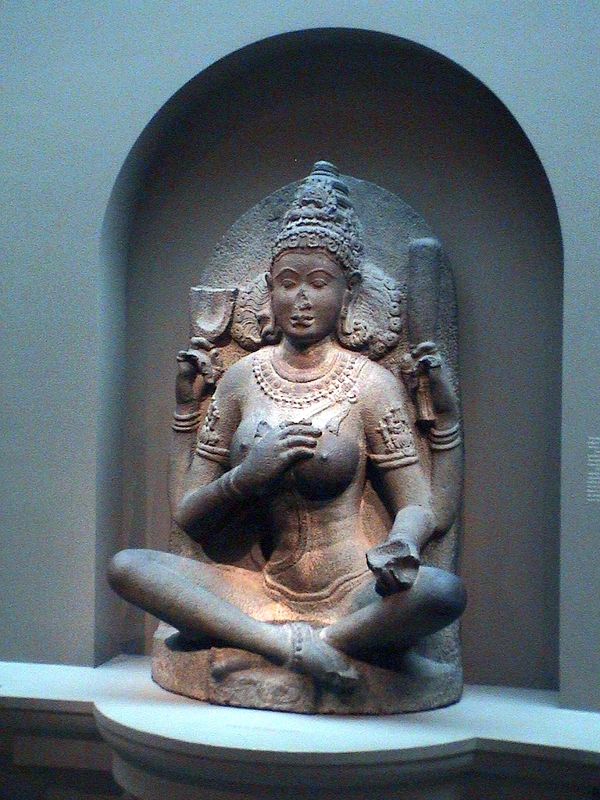 In the Hindu religion Yoginis are females credited with magical powers (Kinsley 287). The history surrounding the yoginis is scarce and can vary from source to source. Consensus is that the cult first appeared around the sixth to seventh century (Gadon 33). The cult did not begin to thrive however, until the ninth century and stayed fairly popular through to the twelfth century (Gadon 33). According to the scholar Vidya Dehejia, the roots of Yogini worship are outside the normal orthodox Brahmanical traditions. The Yogini traditions are tantric in nature and therefore have strong connections to rural and tribal traditions (Donaldson 617). The origin of the Yoginis appears to be in small, rural villages (Dehejia 1). They are local village goddesses, grama devatas, who look over the welfare of an individual village (Dehejia 1). Through Tantrism, these local deities were able to gain new forms and vitality as a group of goddesses who could impart magical powers to their worshippers (Dehejia 2). These powers included: anima (the ability to become very small), laghima (the power to levitate and to be able to leave your body at will), garima (the power to become very heavy), mahima (the power to become large in size), istiva (the power to control the body and mind of oneself and others), parakamya (the power to make others do your biding), vasitva (the power to control the five elements) and kamavasayitva (the power to be able to fulfill all your desires) (Dehejia 53). Village goddesses progressively transformed and merged into powerful numerical groupings (Dehejia 1-2). The numerical groupings associated with the yoginis vary from text to text, but the most common grouping is sixty-four (Donaldson 620). There are very few references to yoginis being alone (Donaldson 633). The numbers eight, twelve, sixteen and sixty-four seem to elevate the yoginis to a higher status (Donaldson 633). The number eight is considered to be very auspicious and have great potency and within the Hindu religion (Dehejia 44). As the square of eight, sixty-four, has even more power and is considered to be extremely auspicious in Tantric literature (Donaldson 633). When the Yoginis are divided into groups of eight it is, usually, to associate each group with a separate deity (Donaldson 634). The groups usually take on the attributes of whichever deity they are connected with (Donaldson 634). Although the grouping of the yoginis into sixty-four is fairly uniform throughout the literature, their names, descriptions and characteristics are not (Donaldson 620). The cult of the yoginis is often associated with a sense of fear and awe because the yoginis are sculpted with demonic expressions or other dark attributes (Gadon 33). When the yoginis are depicted in sculpture or described in text they often have the heads of various birds such as: parrots, hawks, peacocks, eagles, pigeons, and owls (Kinsley 197). They were also carved with characteristics from other animals (Donaldson 619). These include: the frog, elephant, jackal, goat, ox, cat, tiger, horse, and snake (Donaldson 619). Along with having the qualities of birds and other animals, the yoginis are repeatedly talked about as having severed heads in their hands or scattered around their feet (Gadon 33). In one story from the Padna Purana, the yoginis are called by Siva to consume heaps of flesh from a demon head that Siva has severed (Donaldson 622-623). This story talks of how they rejoiced after eating the flesh and drinking the blood of the demon, and describes them as having enormous bodies and sharp fangs (Donaldson 623). Yoginis are occasionally depicted with numerous arms, anywhere from four to eight (Donaldson 640). There are four main traditions that are associated with the cult of the yoginis and how they developed from their tribal beginnings and became integrated into orthodox beliefs (Donaldson 618). All four of the traditions revolve around the idea that the yoginis were minor divinities to greater goddesses. The first tradition is the idea of the yoginis as aspects of the Devi or Great Goddess (Donaldson 618). The yoginis were said to be formed from different parts of the Devi, including: her voice, sweat, navel, forehead, cheeks, lips, ears, limbs, toe nails, womb, and her anger (Donaldson 618). The second tradition is the idea that the yoginis are attendant deities of the Great Goddess (Donaldson 618). This tradition is thought to have developed from earlier tradition of Siva and her gana attendants (Donaldson 619). The third tradition focuses on the yoginis as acolytes of the Great Goddess: the matrkas (Donaldson 618). This tradition describes the yoginis as being born of eight mothers and formed into eight groups (Donaldson 622). The fourth and final tradition centers on the thought of the yoginis as patrons of the goddess of the Kaulas (Donaldson 618). Through the scrutiny of numerous Tantric texts, the yogini cult became associated with a specific Tantric sect called the Kaulas (Donaldson 623). Exploring the yogini temples has been the best way of gathering information about the cult, its practices, and their appearances. Each yogini temple reflects the unique traditions of the area that it is located in (Dehejia 94). This, therefore, leads to many different intepretations of the cult (Dehejia 94). There are certain aspects of the temples that are common. Most of the yogini temples are located in remote areas. For example, the temple of Ranipur-Jharial is located several miles away from the nearest town (Dehejia 103). The temple of Hirapur is extremly isolated, with the only way to access it being through one small dirt lane (Gadon 33). Another common feature among the temples is that they are usually formed in the shape of a circle. Both the Ranipur-Jaharial Temple and the Hiarapur Temple are formed in circles (Donaldson 666, 669). While this information describes the consensus of Hindu scholars there are few definitive texts that contain concrete information about the cult or its goddesses (Donaldson 624). “Yogini namavalis (name-lists) stand in isolation, neither preceded nor followed by any explanatory verses on the worship or status of these deities.” (Dehejia 31). The Puranic and Tantric texts that do speak of the yogini cult, have made it clear that the reason these goddesses were worshipped was to gain an array of occult powers (Dehejia 53). Many Kaula texts refer to the fact that the followers of Kaula believe in the yoginis and will receive blessings from the yoginis in return for their worship (Donaldson 624). The texts also make reference to how those that do not follow the tradition of the yogini cult will be cursed (Donaldson 624). “Tantras that speak of yoginis, reiterate that this is a highly secret, hidden knowledge that was to be divulged only to initiates“(Dehejia 31). Dehejia, Vidya (1986) Yogini, Cult and Temples: A Tantric Tradition. New Delhi: National Museum. Donaldson, Thomas E. (2002) Tantra and Sakta Art of Orissa. New Delhi: D.K. Printworld Ltd. Gadon, E. W. (2002). Probing the mysteries of the Hirapur Yoginis. ReVision, 25, 1. p.33(9). Kinsley, David (1998) Tantric Visions of the Divine Female: The Ten Mayavidyas. Berkeley: University of California Press. Written by Tracy van Paridon (Spring 2009), who is solely responsible for its content.